The Aqua Life Gravel Vacuum from Penn Plax is an easy-to-use, self-starting siphon that allows the home aquarist to clean their aquariums gravel or sand. This is especially important in an aquarium, because a gravel and or sand bed can trap decaying organic matter which will break down into toxic nitrates and phosphates. A clean gravel or sand bed will help keep an aquariums water chemistry in-check and ascetically pleasing to the eye. 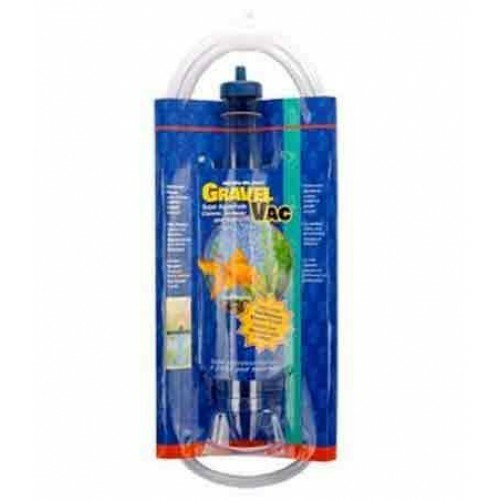 The kit comes with an extra-long tube that extends easily allowing the user to reach all areas of the aquarium. It is designed for easy removal of grungy waste and dirt layers from the gravel bed while leaving the gravel. Aqua Life Gravel Vacuums are used by professionals all around the world. There is no better choice than Aqua Life Gravel Vacuums.